Broken bones are perhaps one of the most unpleasant and easily avoidable side effects of aging. Unfortunately, many women don’t think about their bone health until they are already afflicted by fractures and osteoporosis. It’s not a rare sight either, according to the National Osteoporosis Foundation, roughly 54 million Americans are affected by osteoporosis and low bone mass. Bone health is a preventative and proactive matter, so it’s important to take it seriously before it’s too late. Here are a few things you need to know about your bones as well as a few tips on what you can do every day to keep them healthy and strong! The National Osteoporosis Foundation (NOF) doesn’t recommend a routine bone density test until you reach the age of 65 if you’re a woman, or 70 if you’re a man (1). Despite these standards, doctors will often pressure patients to take the test earlier. This can cause patients to be prescribed drugs sooner than they should in an attempt to slow bone loss. However, these medications have potentially devastating side effects and don’t fight the underlying cause of your condition, which typically comes down to lifestyle factors. Note: If you have a family history of osteoporosis, a history of fractures or if you take bone-thinning drugs like steroids, you may have to undergo an examination earlier in life. This little fact may be confusing, especially if you’ve watched too many milk commercials, but calcium doesn’t actually prevent bone fractures on its own (2). In fact, calcium needs to be taken with vitamin D in order to be properly absorbed by your body. Calcium supplements and calcium-fortified foods and dairy products don’t do your body any favors. The calcium added to these products isn’t as bioavailable as food sources of the mineral. Instead of helping you build your bones, the calcium may accumulate in your arteries and kidneys, which can lead to cardiovascular problems and kidney stones (3). A Harvard study found that a high-calcium diet and regular dairy consumption did not reduce fracture risk (4). A later study found that total calcium intake had no association with hip fracture risk (5). Calcitonin, a hormone produced by the thyroid gland to regulate blood calcium and potassium levels that prevent bone cell breakdown (7). Magnesium, on the other hand, affects bone mineral density by ensuring that calcium stays in bone cells. Doctors say that calcium intake doesn’t matter unless it’s matched by getting plenty of magnesium . Vitamin K2 is responsible for transporting calcium through the body (8). Omega-3 fatty acids, help improve bone strength (9). Beta-carotene is converted into vitamin A in the body, which is then used to improve the intestinal epithelium and enhance mineral absorption in your intestines (10). Vitamin C plays a role in collagen production, which keeps your joints healthy and flexible. Manganese and Boron are important too, the later having the ability to prevent calcium loss through your urine. A Korean study found that an increase of visceral fat after menopause was positively associated with lower mineral density (11). This may be due to the fact that vitamin D is fat-soluble, making it prone to getting trapped in the fat tissue of overweight people instead of being properly utilized (12). Being too thin can also affect bone density, especially if your weight is due to an eating disorder, which can cause a severe nutritional deficiency, or lack of exercise, which leaves your bones prone to fractures and breaks. Your body is constantly making new bones, but after the age of 30, your body is breaking down old bone cells faster than you can make new ones (13). This is because estrogen, like testosterone, actually helps your body maintain bone density. As your hormones levels fluctuate through different stages of life, it can also affect your bones. For example, during pregnancy, your body breaks down your bones at a quicker rate to support your baby’s growth. It can take a few months for your bones to recuperate after pregnancy, so it’s best not to give birth more than once every two years to avoid osteoporosis. Breastfeeding can also affect your bone mass, causing you to lose up to 5% of your total bone density (14). Naturally, Perimenopause and menopause also affect bone mass since your body is producing less estrogen. In fact, a woman can lose as much as 20% of her bone density after the onset of menopause (15). The process rapidly continues until age 65, when it reaches a slower rate. This is one of the reasons why women tend to shrink in height as they age and begin to hunch forward. This occurs slowly over time, but a rapid change in height may indicate advanced osteoporosis, especially in middle-aged or sedentary people. Osteoporosis can occur for a multitude of reasons, but it does have well-known causes (16). The condition can be incredibly hard to diagnose, but if you suffer from the following diseases, it’s important to talk to your nutritionist and naturopath to find out what steps to improve your bone strength. Medication like glucocorticoids and corticosteroids (prednisone, cortisone, prednisolone and dexamethasone) can lead to weak and brittle bones. 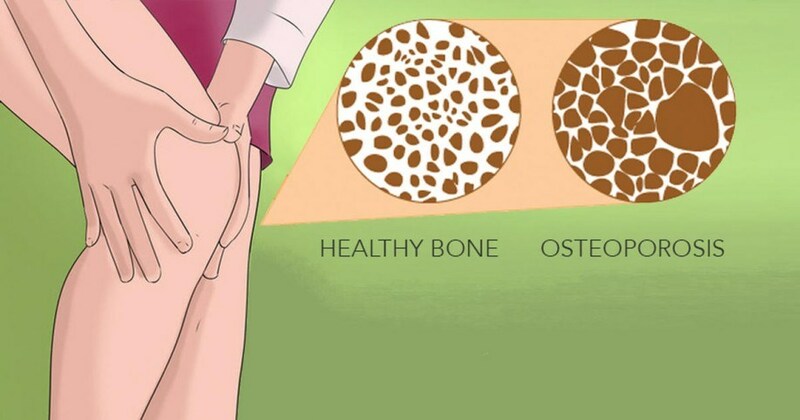 Taking Aromatase inhibitors, selective serotonin reuptake inhibitors, methotrexate, and anti-seizure medication can also increase your risk of osteoporosis. Other lifestyle factors that kill your bones include excessive alcohol consumption, smoking, poor diet, inactivity, and regularly eating sweets and sugar-filled drinks like soda. To save your bones from the mistakes of an unhealthy lifestyle, follow this simple routine everyday. Start your day with a pot of black tea, which is high in fracture-preventing flavonoids (17). Snack on a bowl of yogurt with berries and potassium-rich bananas. Your body needs lots of potassium; if you don’t get enough through your diet, it’ll take it from your bones. (18). If you’re a coffee drinker, stick to one to two cups a day at most. If you’re hungry mid-morning, snack on a few almonds. Before lunch, squeeze in a 30 minute plyometrics workout or pilates class. Follow up with a hearty salad and a hard-boiled egg. If you can, eat your lunch outside to soak up some much-needed sunshine. In the afternoon, snack on a handful of prunes, which are packed with bone-healthy vitamin K, and steep another cup of tea. During your snack, take the time to breathe deeply and release any stress you may be holding onto from your day so far. In the evening, cook up a lean protein like salmon or tempeh and serve with brown rice and steamed veggies. Generously drizzle olive oil over your meal to get a few bone-saving polyphenols (19). Skip dessert and go for a long walk instead. If it’s cold out, take out your yoga mat and stretch out your limbs before bed. This will also improve your balance to prevent slips and falls that may damage your bones. Hit the sack early enough to get at least 7-9 hours of sleep to help your body keep those bones in tip-top shape!